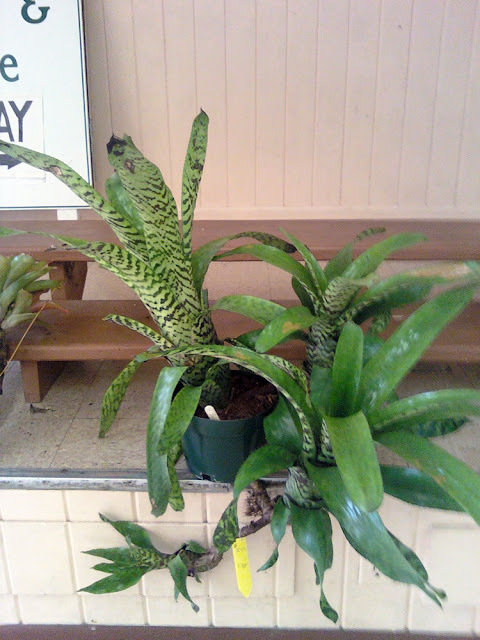 The Rainforest Garden: Bromeliad Shopping! 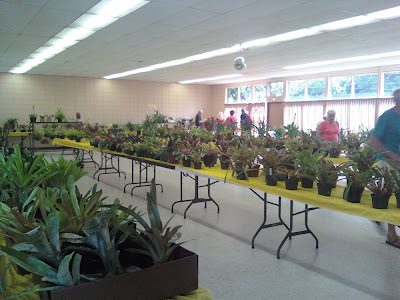 I just got back from the Seminole bromeliad sale and I have taken home quite a haul! Of course I wanted everything in the picture to the left, but 6 bromeliads ended up being enough after all. I also met lots of very helpful members of the bromeliad society, who helped give me input on which plants were the most cold hardy for them, and led me to some really rare cultivars. Oh, and Grower Jim from Garden Adventures was there and he's just as nice and helpful in person as he is on his blog. There were species bromeliads, cultivars, hybrids and even bi-generic hybrids to look at, and I have to admit running around like crazy trying to make a decision on my shopping spree. I didn't want to keep my fiance there too long, since I didn't supply her with a gossip magazine. Of course I mostly opted for what I hope will be cold hardy, even though many of the cold hardy aechmeas and vrieseas had already sold out. There were however, a lot of neoregelias. This is a (say this three times fast) stunning stoloniferous specimen of... well I forget what it is. But isn't it beautiful? 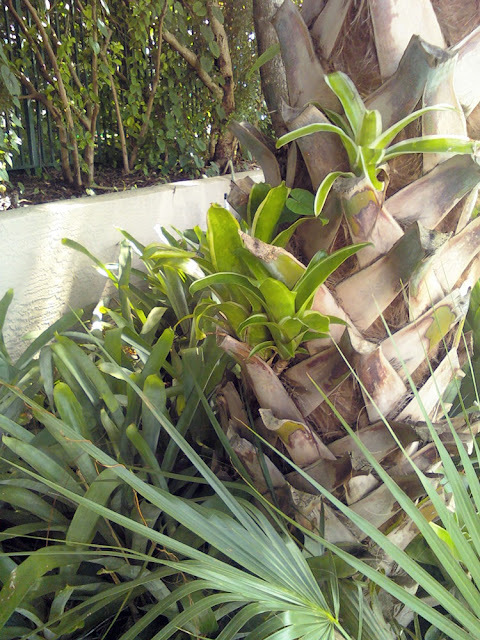 Outside the garden club there's some lovely bromeliad dominated landscaping, like this vignette of billbergia pyramidalis "kyoto" climbing a sabal palm. The vertical leaves of snake plant in the background combine nicely with the flat rosettes of neoregelia spectabilis, while apple green neos in front really pop out from the shadows! So here's my first find, which had the label taken off at the time of purchase, so I don't remember what neoregelia cultivar it is. 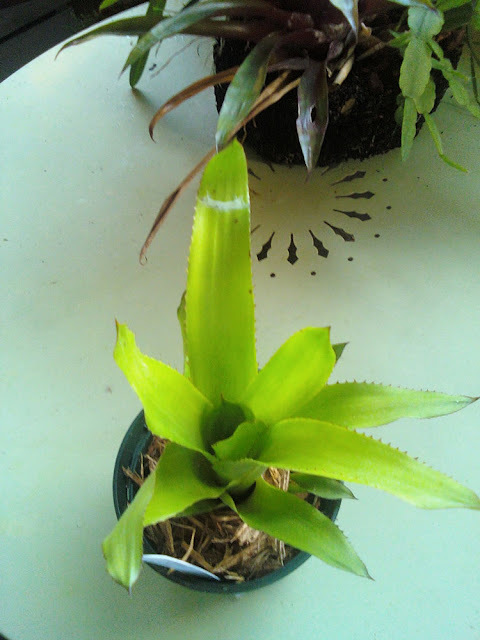 I do know that it will have a hot pink center at flowering though, and the leaves look pretty leathery, spiky, and therefore the plant is likely to be cold hardy. Nidularium Rutilans is a very cold hardy plant with glossy arching leaves, and a much softer texture compared to the neoregelias. Bright red flower bracts will appear in the center at flowering. They prefer deep shade, so its going to stay on my balcony for the time being. The green offset pictured is labeled as aechmea winkleri, but it has stiff leaves with a bluish tinge that make me think it might be aechmea calyculata. The burgundy pup should be aechmea "burgundy", and if it is, the a. distichantha parentage would help make it pretty cold tolerant. 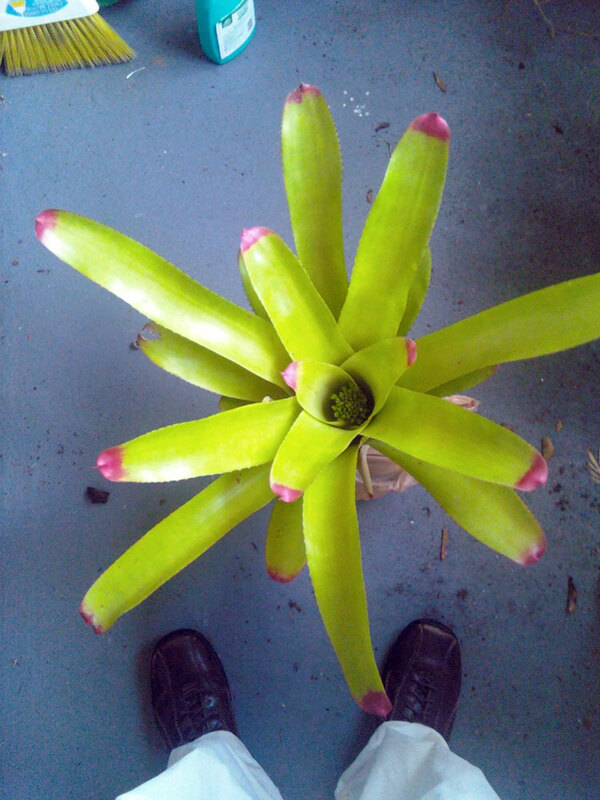 Finally, the piece de resistance is this huge Neoregelia "Sunshine", which seems to have a lot of n. cruenta in it, which is not supposed to be hardy. However, a couple of the society members said it would be hardy, and I can always put it in the garage if I have to for its first winter. I just love the chartreuse leaves and neon pink fingernails too much to let it pass by! Besides, it matches the color scheme of my blog. So there. 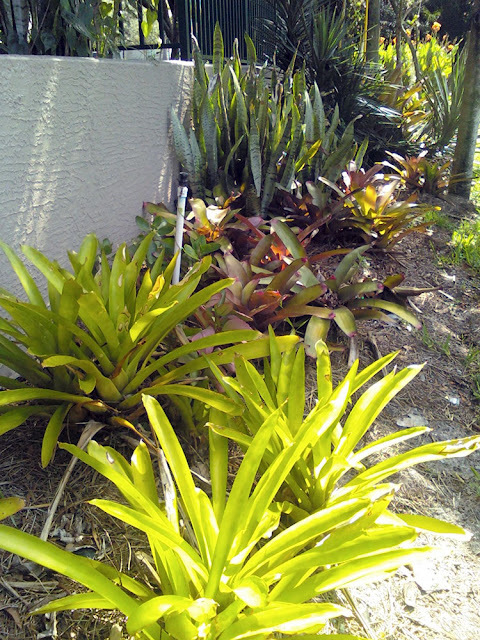 Next post I'll be a little more in depth and show you where I planted these bromeliads, what I moved, etc. and tell you about our trip to IKEA! WOW! Lovely bromeliads! I have yet to try one. I love the Neoregelia "Sunshine", and I agree that it is very important that it matches your blog colours! I now have an urge to buy a bromeliad - pity it is 1215am in Sydney! That stunning stoloniferous specimen reminds me a lot of my Aechmea 'Bert' which does grow in that manner. I really like your 'Sunshine'! The giant neos are always showstoppers. Nice haul! And I appreciate all the pictures of the sale and the planting areas....the shot of the billbergia climbing the sabal palm has me wondering how I can create something similar (inspired by) here in Portland. Beautiful! Sounds like you really had fun shopping! It made me smile when you mentioned that you did not want your fiance waiting too long, because usually it is the guy who doesn't like wait too long when ladies do the shopping! Love your first neo brom, very beautiful! And I think the aechmea "del mar" is a good choice. I saw it at Farichild tropical garden, very stunning flowers! You got some real beauties, Steve. I like the large ones...they really stand out in the garden. I can't wait to hear more about how you planted them. Glad you had a good time. Very successful hunt. May they florish and produce many pups for you. I didn't know there were cold hardy bromeliads! How cold is that? Temps here can get well below freezing, but usually only for brief periods during our winters. 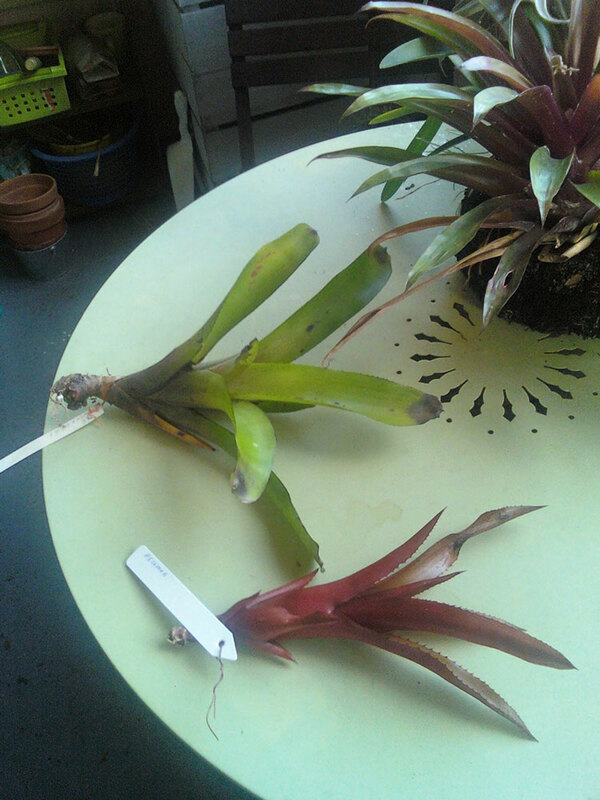 I would love to grow bromeliads if they could survive! Yours are beautiful! Thanks for showing that burgundy beauty! I am on the search now!!!!! I love that sunshine neo :-D Have fun figuring out where to place them. But I am sure you are already an expert in growing broms. I have bitter sweet experience on which brom requires feeding and which not. And how much light (indirect) they require. My guz just show some colours this week. I have been growing it for a year from a young pup. It's going to be a delight to its flower. And as usual I don't even know the colour and species till their flower shows up. Thanks for the kind words, Steve! You picked some lovely plants and you did much better at controlling your buying impulses than I did. I came home with 16 new plants. My prize finds included some Dyckias and my first Orthophytum. 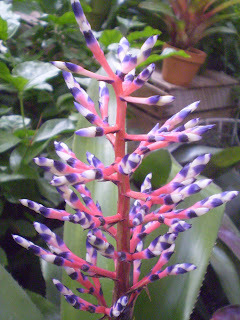 You haven't grown bromeliads yet and you live in Malaysia? Thats like living in a candy store and eating brussels sprouts! You're right! we're actually using a similar color scheme for our wedding too, but with more subtle purples or mauves. I always have an urge to buy a bromeliad... but the only way to find the cold tolerant ones is by making trips to south florida or waiting for bromeliad society sales or botanical garden sales. Hopefully they will become more readily available in the landscape industry. It was awesome! 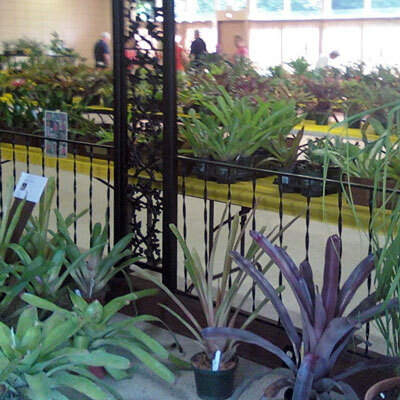 If you ever get the chance, head out to the kanapaha plant sale in gainesville- worth the drive! Even as indoor plants they sure can be amazing! My del mar will have to stay indoors for a few nights in winter. You might try that effect with the bilbergia or aechmea I sent you, but I would plant them at the base first to make sure that they handle the cold okay. If they do, then watch them climb! How cold does it usually get there? Actually I saw it at Fairchild too and thats where I got the inspiration to grow it. I just want a nice macro shot of that flowerspike! Thanks! I'll likely be doing some rearranging soon and keep you posted. If only I could have purchased all the ones I wanted... oh well. you might get away with growing them up there, but only with a lot of protection. I would consider sinking pots in the ground and bringing them indoors when it gets below 20 degrees. I read more about it after I bought it... it even has white berries! I'm no expert... but I do hope to share every experience that I have so others learn from my mistakes! 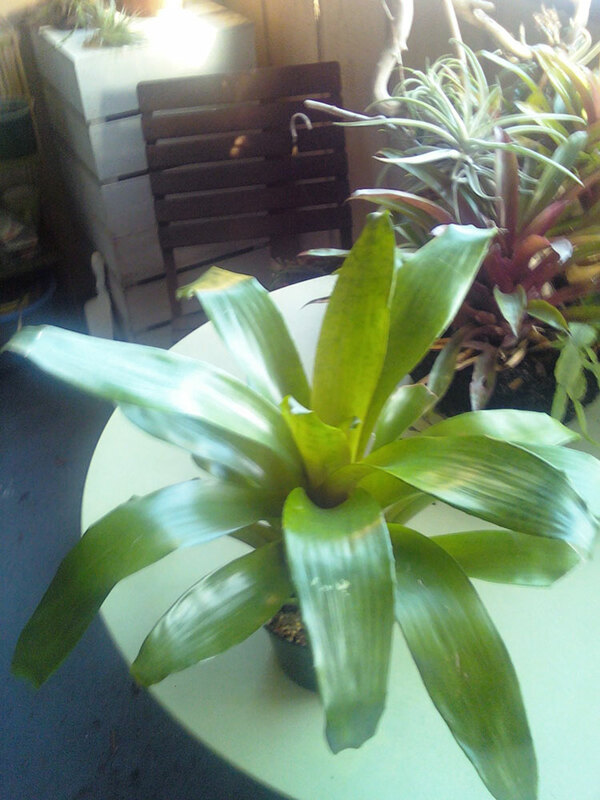 Congrats on your guzmania! Thats one type I can't grow here. A friend gave me a large one (she has 100's of bromeliads)about 6 months ago. Have no idea what kind it is. Then it grew 4 pups. I cut them off (a little too soon I thik, but they are slowly growing)....now there are 3 more pups growing on the mother. 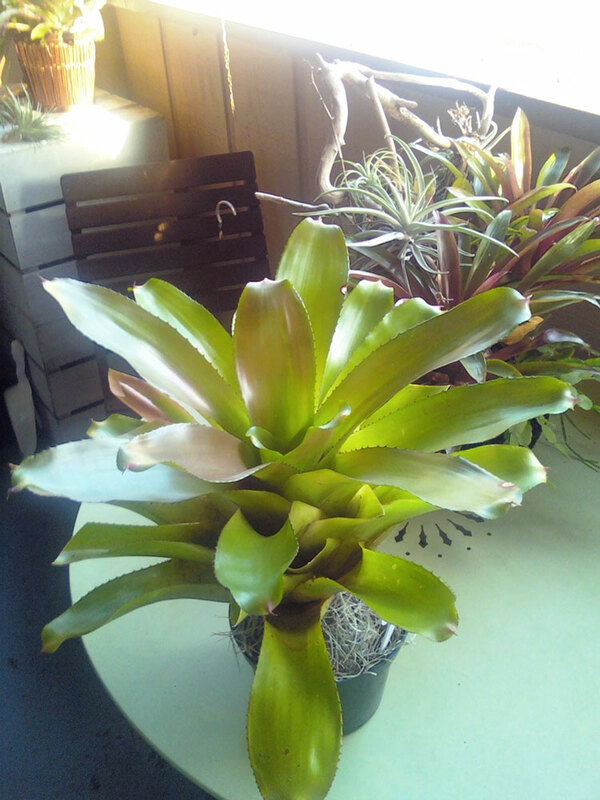 Will I have room for 7 big bromeliads? I will find room somewhere for them. I have a weakness for bromeliad sales, I wish I would have been there. It looks like they had a great selection.